Hard times indeed, when the Earth is threatened with drills and big machinery, spewing her blood from veins deep within her body. Blood that will fuel industries and homes in a last-gasp attempt to eek out the last dregs of profit for those who laid claim to those blood riches. That is not your blood to spill, I hear, yet this cry has reverberated around the arenas of human-made slaughter for aeons and nobody has ever listened until the reckoning of peacetime. Except that this anthropocene has bore witness to the spilling of all the blood in the world. Every single drop that wasn’t white, rich or comfortable to spill. This time it’s Earth Herself who is to keep sacrificing Her innards of shale gas to be offered upon the alter of money, of energy, of fuel, because dear girl, all this makes us happy in the long run. You like your life, don’t you? Surely you gave your silent consent long ago, when you were born into this world and you didn’t complain of the riches, the privilege, of the comfort? Hard times indeed. I squirm in my skin of the lost chances to respond. Because I have blood on my hands too. Yet, the rallying call went up and I’m listening now. I am rallied now. The comfort given to me for my silence can no longer numb me from the means used to stupify me. As individuals it is easy at first to be overwhelmed by the enormity of what is needed to be done. But this is a LIE! have learned that this thought is directly caused by the habit of thinking that we are alone and separate from one another and from the Earth. Find others who agree and who will not collude with the all-too-easy return to sleep! Find those who too have heard the rallying call and who are turning towards the lines. 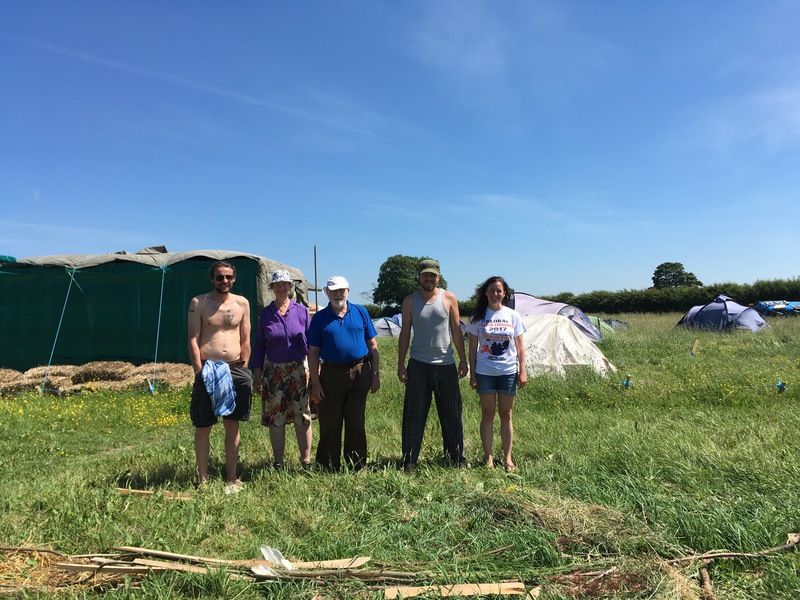 I found such a place at Kirby Misperton Protection Camp last week. I took the baby and we went for an hour to meet the residents and to learn a little about their days. Amid the practicalities of putting a kitchen together, rat-proofing their food stores by using filing cabinets, fixing clattering cabins and moving useful humans across the country, I heard of a deep and real connection to the Earth, I felt the power of place, the genius loci embracing all who come tumbling lost and grief-stricken through the gate. I watched as tears of protectiveness welled in the eyes of one, my own eyes welled up as I felt it too. Fixing me, I heard. This place is fixing us all. Bowled over, surely it is us who are fixing the Earth? Yet even in her cry for help, Mother still heals. Goddess eyes, woven with wool into birch twigs dot about the camp, homemade signs and placards read welcome home. 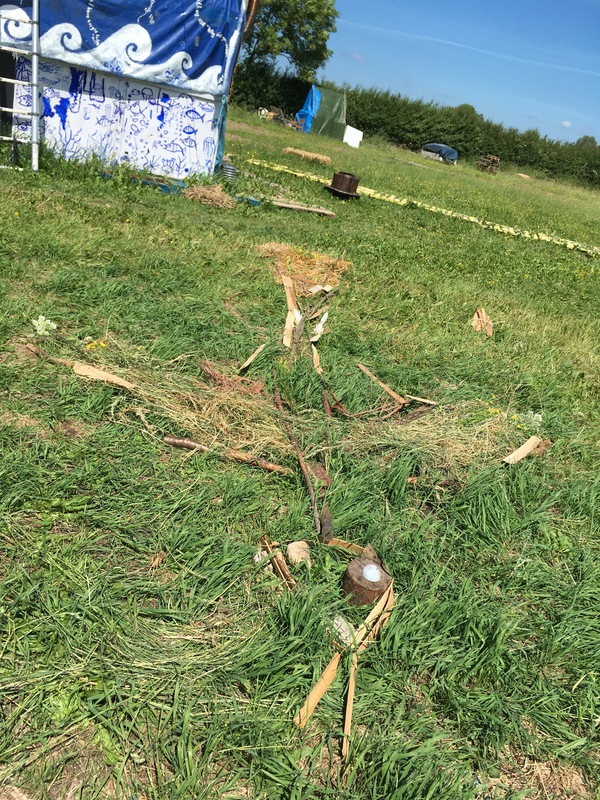 A week later and I return to offer a Global Earth Exchange: an offering of meditation, connection to place, of finding the wound of a place and then making beauty that was created by the inspiring Trebbe Johnson at Radical Joy for Hard Times charity in the USA. The sun beat down on us as we sat next to young willows in the camp. 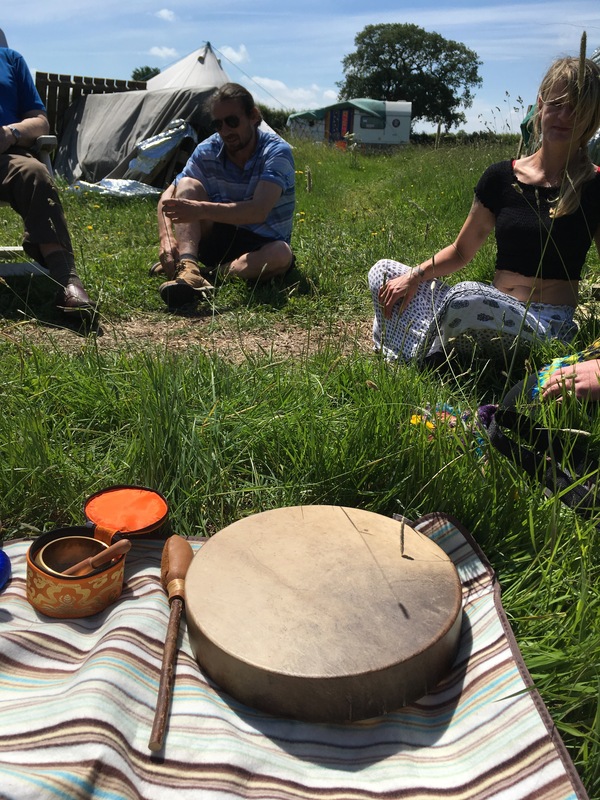 Nine participants plus me, my singing bowls and my drum, making a circle of stillness in the heart of the camp as others around us buzzed about, busy with the tasks of the day: kids making a tarp hide, kitchen goodies being prepared, cups of tea made and imbibed as actions were discussed. Our circle turned inward, to each other, to the group, to the Earth beneath our hearts. We began with a quick introduction of each of us, why are we here? What brought us here? And this is the depth of the wound: grief, rage, how dare they? How dare they? Love, self-healing on a long journey, love, love, love, and a calling responded to. Time and again, the call. Then a meditation, to feel the Earth, to open up to her as if she were a lover, to stand as equals with her and to find what she says to us as silent, still individuals. RadJoy has the term the Ground beneath our hearts and this was utterly perfect for this work. We envisaged the shale gas and we felt our own connection to that. We felt the Earth as our lover. We then went off to spend some time alone to connect more deeply to what we’d experienced. 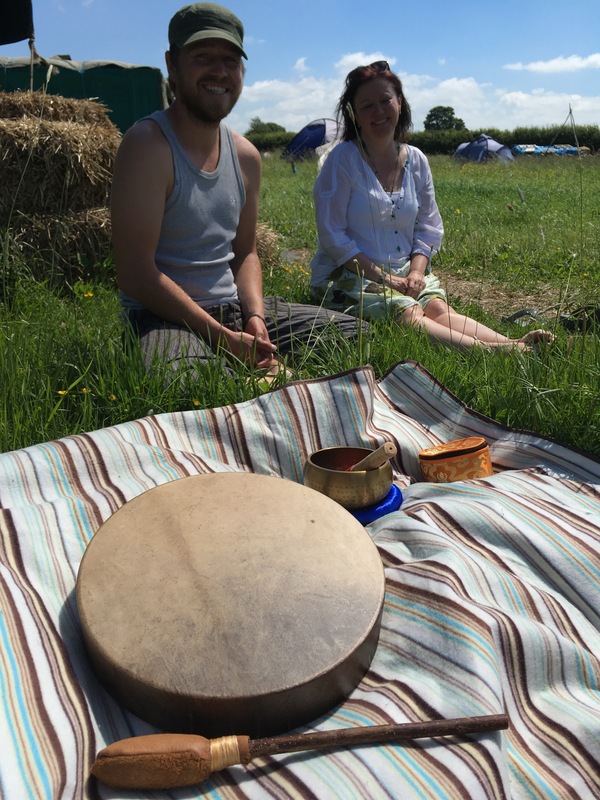 The drum and a bowl were taken, occasionally I could hear the drum as its player walked around the camp. The bowl turned up on Facebook: chill mofos. To the couple of people who remained I played the other bowl, swaying into the bowl’s rhythm and vibrations, it took us deep into its sound and feel. To give vibrations of music back to the Earth. When we returned we made the RadJoy bird; wings outstretched, made from twigs and straw, long grass, cast-off cricket bat ash, half a tennis ball for a beady eye, goose feathers given only the day before for some as-yet-unknown reason (until now) splayed along the tail. The bird took shape under our foraging eyes and the will to create grew and grew in us all as the joy of the making took over. Satisfied at last we stepped back to admire our creation. Beauty made with joy, she lies now in the meadow as a symbol of the kestrel who has frequently visited the camp. Holding hands around the head, we close with a final grounding meditation and a reminder to give thanks to the Earth and to ourselves. Suddenly, Kestrel swoops overhead. Absent for a couple of days this is a portentous moment, just as we finish the GEx. Has she come to check out the new bird? Or because she has been attracted by the love of the group? She glides above us and beyond. Transfixed, we are blessed. Global Earth Exchange or GEx is a powerful thing. It’s a moment of reflection on every emotion that rises up when we notice that we are in the presence of a wounded place. Grief hangs over us like a weighted cloth that smothers our every move and the breath we so desperately need to live. The GEx offers us up to the grief, opens us up and makes us aware of it so that we can look beyond it and notice the radical joy that bubbles and sparkles with creative energy. Right at the edge of despair we find the strength to create joy. But we have to get to that edge, through the pain and the fear, through the grief and rage that hangs so ominously. It doesn’t engulf us because the joy is always felt, somewhere near, somewhere close, and GEx offers a gateway and an invitation to step into it. We make the bird that was lying waiting within us all, waiting to be made by willing hands and open hearts.